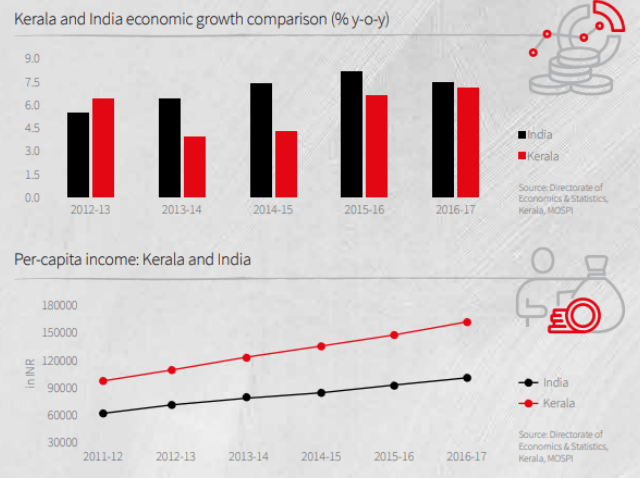 A research report from Jones Lang LaSalle (trading as JLL) reveals Kerala is on the rise and is set for rapid economic expansion. Much of this growth is attributed from workers in Gulf nations including UAE and Saudi Arabia, which both account for 60% of total expats from Kerala. Kerala is a sub-tropical state located in India’s southwestern coast along 600km of the Arabian Sea. The special relationship between the UAE and Kerala has enabled strong socio economic prosperity since the boom of the Gulf nation last century. Per-capita income in the state is wealthier than the national average (x 1.5-1.6).